The diptychs, from the Greek δις, twice, and πτύσσω, I fold, were, agreeably to their derivation, tablets folding in two somewhat after the manner of a writing portfolio, and having three separate columns of equal extent. In the first of these columns were inscribed the names of the holy martyrs who openly died for the faith, and who, from the fact of their being mentioned here, were said to be canonized—that is, worthy of being named in the Canon of the Mass. This was the primitive way of bringing about canonization; and a vestige of it is yet kept up, for, according to the present discipline, when any servant of God has been declared a saint it is customary for our Holy Father the Pope to invoke him in the Mass said on that occasion, after the other saints mentioned (Hierurgia, p. 480, note). The second column contained the names of those who were illustrious among the living, or held places of eminence either in the temporal or spiritual order, such as the Supreme Pontiff, the patriarch, archbishop, or bishop of the diocese, and after these the ruling prince or sovereign. In this same column were also inserted the names of those for whose special intention the Mass was offered, or who contributed bountifully towards the wants of the altar and the support of its sacred ministers. As it was strictly forbidden to receive gifts from those whose lives were in any way scandalous, or who were not considered, strictly speaking, practical Catholics, so it was also forbidden to insert their names in the sacred tablets, no matter how exalted a position in life they otherwise held. In the third column of the diptychs were enrolled those of the dead who departed life in full communion with the Church, but who were not otherwise in any degree remarkable. The substance of these three columns is now distributed among the following prayers, viz. : the first memento, the “Communicantes,” the “Nobis quoque pehcatoribus,” and the second memento. Here we call the reader’s attention again to yet another proof of the reluctance of the Church to make any alteration in the Canon. Although the custom of reading the names of the living and the dead has long since ceased, still the letters “N. N.,” where this reading occurred, have never been removed, although they serve no particular purpose now, nor is the priest required to pause at them in celebrating, as he was of old. Ceremonies attending the Reading of the Diptychs.—In many of the ancient cathedral churches a very great display used to be made—almost as great as that made at the Gospel—when the time for reading the diptychs had arrived. We have said that, as a general rule, they were read from the ambo. For this reason it was customary for the entire congregation to turn their eyes in this direction; and such of them as could conveniently do it would flock around the ambo and remain there until all the names had been read. Whenever any name was read out which was entitled to special veneration it was usual to exclaim: “Gloria tibi, Domine”—“Glory be to thee, O Lord”—as if to thank God for the favors bestowed on such individuals. This was done at a Mass celebrated during the session of the fifth General Council, held in 553 at Constantinople, when the names of Pope Leo the Great and those of the saintly bishops Macedonius and Euphemius were read out (Selvaggio, i. p. 21; Bona, p. 345). Sometimes, too, the names of those general councils in which some remarkable dogma of faith was defined or heresy condemned were also read for the gratification of the people (ibid.) When the names of the persons to be prayed for reached a very high figure, in order not to increase the tedium of the people, a catalogue of them was drawn up and placed on the altar before the eyes of the priest, who would remember them in this manner: “Remember, O Lord! thy servants, male and female, and those also who have a special claim to be mentioned in the sight of thy Divine Majesty; of those, too, whose names we are looking at or express in words.” Marténe tells us that in some churches the practice prevailed through the ninth century of having the subdeacon recite, in a low whisper, to the celebrant the names of those who deserved special commemoration (De Antiquis Eccl. Ritibus, f. 37). The only rite which yet retains the reading of the diptychs in the Latin Church is the Mozarabic. The Saints mentioned in this Prayer.—As is just and proper, because she has the proud title of Queen of Saints and Martyrs, our Blessed Lady’s name heads the list in this sacred catalogue, where she is commemorated as the “ever glorious Virgin Mary, Mother of God, our Lord Jesus Christ.” There is not a liturgy in the East or West in which our Heavenly Queen, with her singular prerogatives, is not mentioned. In the Liturgy of St. James she is styled “the most holy, immaculate, exceedingly glorious, blessed Lady, Mother of God, and ever Virgin Mary.” In that of St. Chrysostom she is denominated “the most holy, under-filed, exceedingly laudable, glorious Lady, Mother of God, and ever Virgin Mary.” The Liturgy of St. Basil the Great styles her “the all-holy, immaculate, super-eminently blessed, glorious Lady, Mother of God, and ever Virgin Mary”; and in the Coptic version of the same she is commemorated in the following manner: “Above all, the most holy, most glorious, immaculate, blessed Lady of ours, Mother of God, and ever Virgin Mary.” Nor are the Nestorians, who deny her the title of Mother of God, behindhand, for all that, in showing her every other mark of reverence and respect. They invoke her as follows: “The prayers of the Virgin Mary, Mother of Jesus our Saviour, be to us at all times a wall of defence by day and by night.” And in another place they say of her: “Rejoice and exult, O thou who art full of grace, holy and chaste Virgin Mary, Mother of Christ, because the archangel became a heavenly messenger unto thee, O thou, Mother, who in virginity didst bring forth the Wonderful, the Counsellor, and Saviour of the world.” The Rev. Mr. Badger, from whose work (The Nestorians and their Rituals, ii. p. 249) we copy these words, declares his utter astonishment at the intense devotion manifested by these heretics to our Blessed Lady; he is forced even to confess—with much reluctance, we may be sure, for he is a Protestant of the first water—that they do not scruple to apply to our Lady, now and then, the epithet Theotokos—that is, Mother of God—of which so much was said at the General Council of Ephesus in the year 431, where Nestorius himself was condemned. The reader will see in this work of Badger many good points on the devotion of the Eastern heretics to our Blessed Lady. Before we enter on a history of the other saints mentioned in the “Communicantes” we deem it well to inform the reader that it is only those who are ranked as martyrs who have a place in the Canon; and this is another proof of its great antiquity, for it was not until the fourth century that the Church instituted feasts in honor of the other classes of saints. St. Peter.—The Prince of the Apostles was a native of Bethsaida, and, as tradition goes, was our Divine Lord’s senior in age by about ten years. He received at his circumcision the name of Simon, or Simeon, meaning in Hebrew “Jehovah hath heard,” but this was afterwards changed by our Lord to “Kipho,” generally written Cephas in English, from the Syriac ܒܝܦܐ—a rock. St. Peter was a married man, but a very ancient tradition, upon which St. Jerome lays particular stress, assures us that after his call to the apostleship he and his wife (a very holy lady) agreed to live continent the rest of their lives. He had a daughter named Petronilla, whom the Church honors as a saint on May 31. Our glorious apostle, as is well known, suffered death under Nero on the Vatican Hill, where, at his own request, he was crucified head downwards. He is represented in most of the early paintings as bald on the crown of the head, but having a thick circle of hair growing round the under part, after the manner of some of the clerical tonsures worn by members of religious orders. In Anglo-Saxon art he is always beardless, to favor a long-standing tradition that the pagans, in order to make him as despicable-looking as possible in the eyes of the people, shaved his head closely. Ever since the eighth century it has been customary to represent him with a pair of keys in hand, symbolic of his power in heaven and on earth. Many will have it appear that the ecclesiastical tonsure, so-called, owes its origin to the indignity practised on our apostle by the pagans—viz., shaving his head. St. Paul.—St. Paul was a native of Tarsus, a city of Cilicia, in Asia Minor. After his miraculous conversion to the faith he went to Jerusalem, where, through the mediation of his companion, St. Barnabas, he made the acquaintance of SS. Peter and James. With the former he became associated in the see of Rome, and together with him suffered martyrdom about the year 67 of our era and the twelfth of the reign of Nero. The two holy apostles are generally named together, for, as the Church sings of them, “in life they loved each other; in death they are not separated.” According to some, our apostle changed his first name, Saul, to Paul through respect for the Proconsul Sergius Paulus, whom he converted to the faith. Others say that he took the name from the Latin paulus, “little,” because, as he says in his own profound humility, he was the least of the apostles. St. James, July 25.—This blessed apostle, generally known as St. James the Greater, because of his seniority in years to St. James, commonly styled the “brother of the Lord,” was son of Zebedee and Salome, and brother of St. John the Evangelist. It was this apostle who, in company with St. Peter and St. John, formed the three that were present on Thabor at our Lord’s Transfiguration and in the Garden of Olives when his agony began. By command of Herod Agrippa, who, as the Acts of the Apostles relate (chap. 12), “stretched forth his hands to afflict some of the Church,” he was “killed with the sword.” This happened about the year 43. The body of the apostle was first interred at Jerusalem, but was finally removed to Spain, where it is alleged he once preached the Gospel, and deposited at Iria Flavia, now El Padron, on the confines of Galicia. By order of Alphonsus the Chaste, King of Leon, it was subsequently transferred to Compostella (a corruption of Giacomo Postolo), in whose cathedral it lies at present. From this circumstance our blessed apostle has been chosen as the Patron of Spain under the name of Sant Iago di Compostella. A military order, known as that of “St. James the Noble,” was established in his honor by Ferdinand II. in 1175. St. John, December 27.—This holy apostle and Evangelist, called in the New Testament “the disciple whom Jesus loved,” was a Galilean by birth. According to a tradition of long standing, he is said to have dwelt at Jerusalem until the death of our Blessed Lady, which took place, it is said, about the year 48, and that then he journeyed into Asia, where he is said to have founded the seven churches mentioned in his Apocalypse. Authentic accounts say that he died and was buried at Ephesus when about one hundred years of age. According to Polycrates, St. John always wore the golden plate of the Jewish high-priest upon his forehead, upon which was engraved “Kodesh le Jehovah”—“Holiness to Jehovah.” The Greeks generally style him “St. John the Divine.” From his great purity, having always led a single life, and from his singular intimacy with our Divine Lord, many of the Oriental Fathers held that he was taken up, body and soul, to heaven like Enoch and Elias. Though he died a natural death, he is by all esteemed a martyr from the fact that he submitted to martyrdom when cast by order of Domitian into a caldron of boiling oil, from which he escaped unhurt. St. Thomas, December 21.—According to the most general opinion, this apostle was by birth a Galilean. Parthia was given as his field of labors when the portioning out of the globe was made among the twelve. He is said to have met death by being run through with a spear by the Brahmins of India. As he is universally styled the “Doubting Disciple” (from the fact of his saying that he would not believe the other apostles, who told him they had seen our Lord after he had risen from the dead on Easter Sunday, unless he saw him with his own eyes and examined his wounds), it is commonly said that the shortest day in the year was assigned as his feast day, to remind us of the shortness of his faith. 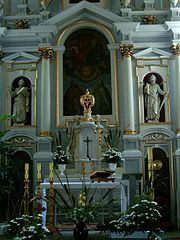 St. James, May 1.—The second apostle mentioned by the name of James is he who is generally styled the “brother of our Lord,” from a Hebrew usage of thus naming cousins-german. He is called “James the Less” from being younger than the other of the same name, and “James the Just” on account of his great sanctity. He is said to be the son of Alphæus and Mary (sister of the Blessed Virgin). It is the general opinion that he was the first bishop of Jerusalem, having been appointed to that see soon after our Lord’s Ascension. Like the “Beloved Disciple,” he is said to have always worn the plate of gold peculiar to the Jewish high-priest, as an ensign of his consecration to the Lord. According to Hegesippus, quoted by St. Jerome, and others, he met death by being cast by the Jews from the battlements of the Temple and afterwards despatched with a blow from a fuller’s club. It is said that the resemblance of this apostle to our Lord was so great that it was difficult to tell the two apart, for which reason Judas found it necessary to tell his band to seize upon him whom he would address. “Whomsoever I shall kiss,” said he, “that is he; lay hold of him and lead him away carefully” (Mark 14:44). According to the legend, St. James said he would eat nothing from the time he partook of the Last Supper until our Lord had risen from the dead. Soon after the Resurrection it is said that our Lord appeared to him and asked for a table and some bread, whereupon he said to the saint: “My brother, eat thy bread, for the Son of Man is risen from among them that sleep.” According to St. Gregory of Tours, our saint’s remains were interred on Mount Olivet in a tomb which he had built for himself. He is the author of the Catholic Epistle called after his name, and which the disdainful heretic Luther denominated “Epistola straminea”—an “Epistle of straw”—because it says very pointedly that faith without good works is dead, for which reason Protestants rejected it formerly. St. Philip, May 1.—St. Philip was born at Bethsaida, and received as the place of his apostolic labors, upper Asia. He finally came to Hierapolis, in Phrygia, where he suffered martyrdom at a very advanced age. One of his arms was brought from Constantinople to Florence in the year 1204; the rest of his body is kept in the Church of SS. Philip and James at Rome. St. Bartholomew, August 24.—According to the most exact commentators, our saint and Nathanael are one and the same person. He is said to have been born at Cana of Galilee. His name, Bartholomew, comes from the Syriac bar, a son, and Tolmai, a proper name. As to the precise manner of this apostle’s death authorities are not agreed, but all hold that he died a martyr, and this, according to St. Gregory of Tours, in Greater Armenia. One of his arms, it is said, was sent by the Bishop of Benevento to St. Edward of England (Edward the Confessor), who deposited it in the Cathedral of Canterbury. In art he is generally represented with a butcher’s flaying-knife, the supposed instrument of his torture, in commemoration of which the strange custom of bestowing such knives as gifts on the recurrence of the feast once prevailed at Croyland Abbey. St. Matthew, September 21.—St. Matthew was, according to the most general opinion, a native of Nazareth, and a publican by profession. His original name was Levi, but this he abandoned when he became an apostle. Ethiopia is generally assigned as the field of his apostolic labors—not the African Ethiopia, but that which corresponds with the ancient Chaldea. At Nadabar, a city of this region, he is said to have ended his days by martyrdom. St. Simon, October 28.—To distinguish this saint from the Prince of the Apostles, who was called Simon Peter, and from St. Simon, brother of St. James the Less, he is generally known as Simon the Cananean, and sometimes Simon Zelotes. According to St. Jerome, the epithet last mentioned is the Greek equivalent of the Hebrew Chanaanite, a zealous imitator, so that it must not be supposed that our apostle was a native of Cana from having this epithet attached to his name. According to the Greek menology, our apostle passed over into Britain towards the end of his career, and was there crowned with martyrdom. St. Thaddeus, October 28.—This apostle is known in the New Testament by three different names—viz., Jude, Thaddeus, and Lebbæus. By the last-mentioned name he is called in the Greek text of St. Matthew. It is generally understood that our apostle changed his first name, Jude, to his second, Thaddæus, in order not to have the same name as the traitor Judas Iscariot. Others say that he did so out of respect for the ineffable name of Jehovah, which the Jews would never pronounce. His field of labor was first Samaria, then Syria and the eastern parts. His martyrdom is said to have occurred in Persia. He wrote an Epistle, which, like that of St. James, is denominated Catholic, from the fact that it was addressed to no Church in particular, but to Christendom at large. St. Linus, September 23.—St. Linus was the immediate successor of St. Peter in the Roman see, over which he reigned twelve years, and suffered martyrdom about the year of our Lord 87. St. Cletus, April 26.—St. Cletus succeeded St. Linus as pope, and ruled the Church for about thirteen years. His martyrdom is said to have taken place about the year 91. There has always been much dispute as to whether this saint and Anacletus are two distinct persons or one and the same. Most probably they were different. In the Gerarchia Cattolica Anacletus is reported to have governed the Church from A.D. 100 to 112, and that then he died a martyr. The two are also distinguished in the Liberian Calendar. St. Clement, November 23.—St. Clement, the companion and fellow-laborer of St. Paul, was, according to the most reliable accounts, a Jew by birth. He is specially mentioned by the Apostle of the Gentiles as having his name in the “Book of Life.” An epistle written by him to the Christians of Rome in their severe hours of trial has been looked upon by many as a work of inspiration; and, from its great resemblance to St. Paul’s Epistle to the Hebrews, the authorship of the latter has been often called into question. St. Clement met death, it is said, by decapitation, under the persecution of Trajan. St. Xystus August 6.—He suffered martyrdom under Valerian in 258. St. Laurence, August 10.—It is generally supposed that St. Laurence was by birth a Spaniard. All are unanimous in saying that he suffered martyrdom in A.D. 258, and this on an instrument made after the manner of a gridiron, which was heated to redness and then the saint placed upon it. One of the most celebrated monuments built in honor of him now in existence is the famous palace of the Escurial, fifteen miles from Madrid, in Spain, which was founded by Philip II. in 1557, out of gratitude for a victory over the French at St. Quentin, in Picardy, on the feast of St. Laurence. The palace is built in the shape of a gridiron, the royal apartments forming the handle, and the church the body of the instrument. It is built of solid granite, 700 feet long, 564 wide, and 330 feet high. Over one of its main grand entrances are six beautifully-finished statues, each seventeen feet high, of Kings David, Solomon, Josaphat, Ezechias, Manasses, and Josias. This structure is one of the greatest curiosities, perhaps, in the world. St. Chrysogonus, November 24.—Very little is recorded of this saint, further than that he was slain by the sword and then cast into the sea. His body was afterwards found and is now said to be kept at Venice. A church was built to his memory in the Trastevere in A.D. 599. SS. John and Paul, June 26.—These two saints were brothers and officers in the Roman army together under Julian the Apostate. They received the crown of martyrdom about the year 362. SS. Cosmas and Damian, September 27.—There were three pairs of saints who bore the names of Cosmas and Damian, but it is almost universally admitted that the two mentioned here were those who suffered at Rome during the persecution of Diocletian. The reader will remark that in the enumeration of the apostles in the “Communicantes” SS. Mark and Luke do not occur, and this because it is not certain whether they were martyrs or not, and none but such are named in the Canon. “Communicantes” in the Eastern Church.—Protestants would fain have it believed that “saint-worship,” as they term the holy practice, is entirely confined to the Church of Rome and has no place at all in the churches of the East; but evidence too strong to be rejected, or even called in question, proves that such is not the case; that the Eastern Church as well as the Western believes, confesses, and practises the doctrine that the saints of God, as such, ought to be revered, venerated, and invoked. “I believe and confess,” says the Ritual of Russia in its article on adult unction, “according to the understanding of the Holy Eastern Church, that the saints who reign with Christ in heaven are worthy to be honored and invoked, and that their prayers and intercession move the all-merciful God to the salvation of our souls” (Rites and Customs of the Greco-Russian Church, by Romanoff, p. 308). Part of the Armenian “Communicantes” reads as follows: “O Lord, through the intercession of the immaculate parent of thine only-begotten Son, the holy Mother of God, and the entreaties of all thy saints, and of those who are commemorated this day, accept our prayers” (Smith and Dwight, Researches in Armenia, i. p. 185). The following extract will show that the Nestorians are sound on this doctrine also: “O ye saints, prophets, apostles, doctors, confessors, martyrs, priests, and hermits, pray to Christ your strength for us all; that through your prayers we may receive out of his treasure an answer to all our prayers as may be profitable to us” (from the collection of Collects at the end of the Khudrah; Badger, ii. p. 138). We could thus go on reciting at pleasure testimonies from all the churches of the East, to show how sacred a duty the veneration of the saints is considered to be in all those regions, and how very efficacious before the throne of God; but as what we have said is sufficient to convince any unbiassed mind of this fact, we do not think it necessary to continue the subject further. The priest, while reciting this prayer, keeps his hands spread out over the oblation, after the manner of the priests of the ancient law, who observed a similar usage in regard to the victims offered in sacrifice (Exod. 29; Levit. 1:4). As this prayer comes close upon consecration, it is customary for the server to ring the little bell at the beginning of it, in order to remind the people of the near approach of that moment when our Divine Lord will be present on the altar. According to Durandus (Rationale, p. 249), Pope Leo the Great composed and inserted the first part of this prayer down to the words “placatus accipias.” The remainder was added by Pope Gregory the Great, in order to beg of God to avert the horrors of war and pestilence that threatened Rome in his time (Romsee, p. 199). An ancient Roman ordo prescribed this prayer to be recited with hands raised aloft—a ceremony which the Dominicans yet keep up, and which was formerly observed in all those places of England where the Sarum Rite was followed. The Carmelites recite it lowly bowed down with hands resting upon the altar. According to Romsee, our present custom dates no further back than the fifteenth century, and we see that the Orientals do not observe it. This prayer is worded thus: “Which oblation we beseech thee, O Lord! that thou wouldst vouchsafe in all respects to bless, approve, ratify, make rational and acceptable, that it may become the Body and Blood of our Lord Jesus Christ.” The Latin word “rationabilem” is here sometimes rendered in English by reasonable, sometimes by rational. The latter is the better word, because less liable to be misunderstood, for the epithet is evidently given with a view to distinguish the effect which is about to be produced on the bread and wine from the sacrifices of the old law, all of which were irrational, inasmuch as they were constituted of nothing but of bulls, goats, etc. (Durandus, p. 253). In reciting the latter part of this prayer the priest makes five crosses over the oblation, three over the Host and chalice conjointly, and one over the Host and chalice singly. As to the peculiar import of these five crosses there is want of agreement among liturgical writers. No one, so far as we have seen, has attempted any other explanation of them than a purely mystical one. Some say they are commemorative of the Five Wounds; others that they are intended to recall to mind the threefold delivery of our Lord—viz., to the Jewish priests, to the scribes, and then to the Pharisees—and the duality of his nature. A very nice interpretation of them is that they are intended to remind us, now that consecration is about to take place, that the Blessed Victim who is going to be present on our altars suffered in his five senses during his bitter Passion—in his seeing, when the Jews veiled his face; in his hearing, when they laughed him to scorn; in his taste, when they gave him vinegar and gall to drink; in his smelling, when they conveyed him to Calvary, a hill used as a receptacle for dead bodies, whence its name when interpreted from the Hebrew, “a place of skulls”; and, finally, he suffered in his touch, when his hands and feet were nailed to the cross and his side pierced with a lance (Enchiridion de Sacr. Sacrif. Miss. Ben. XIV., p. 71).